We have a range of nests to choose. Soft fabric ones to tuck baby into before placing into a flokat or photography prop. Or we have a natural twig nest that has been especially for us which is big enough for twins. 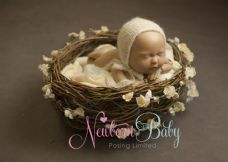 You need to fill your nest with something soft, add a posing cushion underneath baby's head and bottom or even use one of our posing rings. You'll see the effect is lovely.